Not long after the previous post, I got yet another error, this time on an NTFS partition. This required a slightly different sequence of steps, so thought I’d document those for the next time this happens. 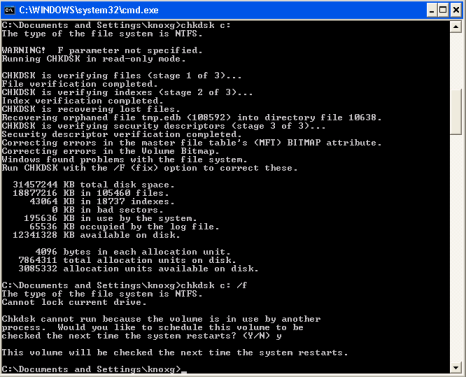 This blog post describes determining a file contained within an NTFS partition at a specific VMDK offset . For a description of recovering data from an ext4 partition, see the previous post instead. First I moved the dodgy virtual machine (/var/vmware/bnedev01/*) to a separate location on the hypervisor’s filesystem (/var/vmware/x/bnedev01-corrupt/*) , which will update the directory entries but keep the files in the same place, so the bad sectors on the hypervisor still affect the same files as before the move, relatively speaking. I then made a new copy of the virtual machine (back into /var/vmware/bnedev01/*), using dd to copy the vmdk extent that contained the bad sector on the hypervisor. So pretty much the same thing as bnedev03 in the previous post, except the bad dd records/blocks are in bnedev01-s003.vmdk, and contained in the range 2317784 to 2317790. To get the files corresponding to these blocks, I need to get the partition table on the disk, and run ntfsinfo over the C: partition. Notice that for this machine I’m running these commands outside the virtual machine, rather than inside as was the case for bnedev03. 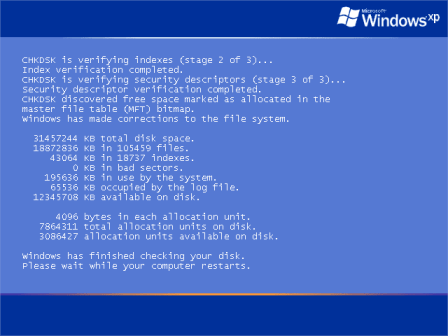 The virtual disk, 'bnedev01.vmdk', was corrupted and has been successfully repaired. Now I’ve got the partition table, I can setup a loopback device for the first partition, and check that it is recognised as an NTFS partition. The loopback device /dev/loop0 is setup at offset 32256 into /mnt/bnedev01-disk0/flat; which is the starting sector (63) * number of bytes per sector (512), as described here. So again, not a terribly important file; rather than restoring this file from backup, I might as well just clear out the /Documents and Settings/knoxg/Local Settings/Temp folder. So there you have it. Go in peace, and it’s a Sunday so get to church you heathen scum. Just a footnote on my method for ‘commenting out’ files/folders that I still want to retain for a while. I’ll normally put these under an ‘x‘ folder (or prefix ‘x-‘ to the filename), since it (a) usually drops it to the bottom of an alphabetic listing of the directory, and (b) reminds me vaguely of this Monty Python sketch). If the file is a distribution file which I am then modifying, I usually append .orig to the old file instead. If I need to change the extension because it will otherwise be picked up by something like javac *.java, then I’ll append something like .nocompile to it (so someClass.java becomes someClass.java.nocompile).